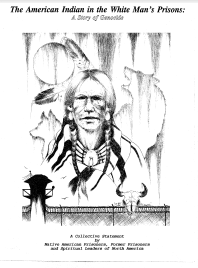 Now available as a free download: The American Indian in the White Man’s Prisons: A Story of Genocide, Compiled and edited by Little Rock Reed. This textbook has been provided by Hal Pepinsky, who scanned his copy and offered to critcrim.org to honor Rock’s memory. We hope this important work might be widely read and used. Thank you Hal! “This book is wonderful, POWERFUL! …. .. The writers in this volume, most of whom are present or former Native American prisoners and spiritual leaders, are masters at portraying the pain and suffering of their people through the written word. They are spread out in so many networks and so routinely transferred across prisons and prison systems as ‘security risks,’ that by legal mail and any other available means, they have among them a knowledge of prison conditions in North America far surpassing any other news network or body of literature I have seen. They are pressing the federal and state governments on a variety of issues such as having nuclear waste dumped on treaty grounds; and the prison awareness of these writers is matched by their global awareness of the confrontation between fundamentalist white Christian North America, and indigenous spiritualism. As we enter the second quincentennial of white European invasion of the Americas, the first peoples are united as never before on what is at stake for themselves and for mother earth in this basically religious struggle. Nowhere on this continent is the battle ground bloodier and more raw than in u.s. prisons, in ‘control units’ for activist prisoners in particular. Indian activists are routinely receiving extended imprisonment, getting beaten and assassinated in prisons across the United States and Canada for no good reason. Here for the first time, Standing Deer Wilson himself describes how he agreed to help the fads assassinate American Indian Movement leader and political prisoner Leonard Peltier. Miraculously, both of them live today. That is not true of many of their brothers and sisters. If you think George Orwell’s 1984 is bad, wait until you read The American Indian in the. White Man’s Prisons: A Story of Genocide. The most remarkable and revealing part of this clash is that Indian prisoners are asking only to establish culturally relevant rehabilitation programs designed by and for their own people (if their suggestions in this book were to be taken seriously by policy makers, I believe the recidivism rates across the U.S. would decrease significantly for all racial and ethnic groups — their suggestions are a substantial constructive response to the prison crisis); and they ask to be allowed visits with their spiritual advisors (‘ministers’ we Anglos call them) and to celebrate worship in their own way. They may, like Peltier and Standing Deer, go on a prolonged hunger strike to obtain these rights; they may go to courts and legislatures; but perhaps most exasperatingly to their keepers, they are concertedly nonviolent and open. The strong ones among them, like these writers, follow a moral code so demanding, and remain serenely themselves in their commitment so steadfastly, as to terrify their keepers. To understand this terror of the keepers is to understand how we outside prison walls continue to accept the attempted genocide of the indigenous spirituality in ourselves, to say nothing of those who would live by it in our midst. It is true I come to this book as one whose career in teaching and research takes me to prisoners and into their worlds, but this book is not only for criminologists, it is for nonnative peoples across the face of this continent, and indeed on behalf of aboriginal rights worldwide.